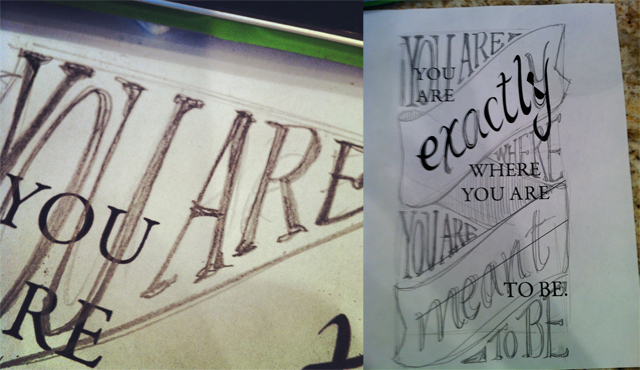 Make It Monday: Typography Results! Happy Monday! It's party time over here at Pars Caeli. I was super duper lucky to be able to host this month's DIY date, typically hosted by the amazing Louise. She let me pick our project, and I chose one of my faves - TYPOGRAPHY. 1. Emily (a real, live amazing artist) created this piece in honor of her blog birthday. Inspired (go get it)! 2. 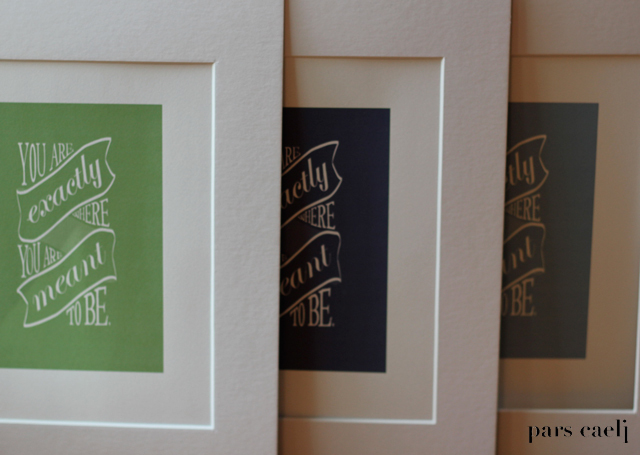 Joy, style queen and talented writer, brought love to life in her print (just for you, too). 3. Louise, both poet and painter here, made a rich canvas of word and color (I so enjoyed the meaning behind it all). 4. Brynn, full of flavor and fun, brought this whimsical quote to real life. Check out her mad skills. 5. Erin finds art that rocks my world and now she's showing us (yes, tutorial) how to use Photoshop to make cool images (like this lovely) for ourselves. 6. ME! I've been wanting to do something with transparencies, Helvetica, and one of my favorite quotes/hymns (take it for your space, too). Read below to find out more. Hugs to all these wonderful women who designed, crafted, and prepared one-of-a-kind awesomeness. I feel so blessed to be able to host it all here at Pars Caeli. I can't wait to see what Louise has ready for us in November. Wanna join us? If you'd like to download Julian of Norwich and my co-creation (smile), you can download it here. Julian was a woman far wiser than I with divine inspiration and knowledge of our place in God's plan. It is said that God appeared to Julian and spoke these words. …All shall be well, and all shall be well, and all manner of thing shall be well. Life's molehills and mountains can wear me out. And I can find myself staring more at my feet than looking ahead or around at the graces that lie right where I am. In the tumult I say to myself, All will be well. And now it's perched right at the bottom of our staircase to remind me as I walk my kiddos downstairs for breakfast or run frantically around to get myself ready to go. Happy Monday! And thanks for coming over. It's so good to have you here!! So I thought about my three winners: Hana, Louise, and Courtney. All three of these ladies are creative, talented, savvy women. They were each going through transitions with their on-line lives. I know that these sorts of changes can be stressful, annoying, and can sometimes make you question if it's all worth it. Enter a little bit of printed reassurance. 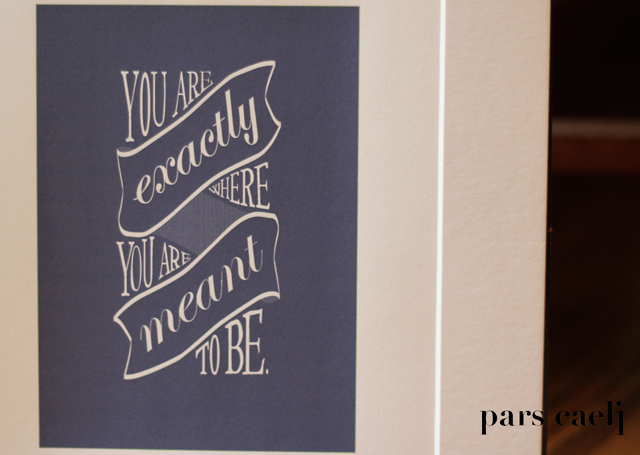 You are exactly where you are meant to be. Certainly, I thought about the rest of our lives and how we can find ourselves somewhere (physically or mentally) where we never thought we'd be...the sometimes unexpected, notably unpleasant, tough places we land. The older I get, the more I realize how significant these places of challenge are and how much they have to teach us if we can hold on, breathe deeply, and trust. I loved sketching these and thinking about their future homes in New Zealand, California, and Florida. I asked the ladies what colors might work in their homes, and I received a green and two blues. Beautiful Louise even sent me a photo of her (gorgeous) living room. The task of converting these sketches to Illustrator files was a time-consuming, but I love how they turned out. I'm not sure which color I like the best? And for you, dear readers, a black and white version for your downloading pleasure. Sometimes we all need a little reassurance. Click on the image to download the file. Did you create something this weekend? Any projects on the near horizon? May today there be peace within. May you trust God that you are exactly where you are meant to be. May you not forget the infinite possibilities that are born of faith. May you use those gifts that you have received, and pass on the love that has been given to you. May you be content knowing you are a child of God. Let this presence settle into your bones, and allow your soul the freedom to sing, dance, praise and love. It is there for each and every one of us. 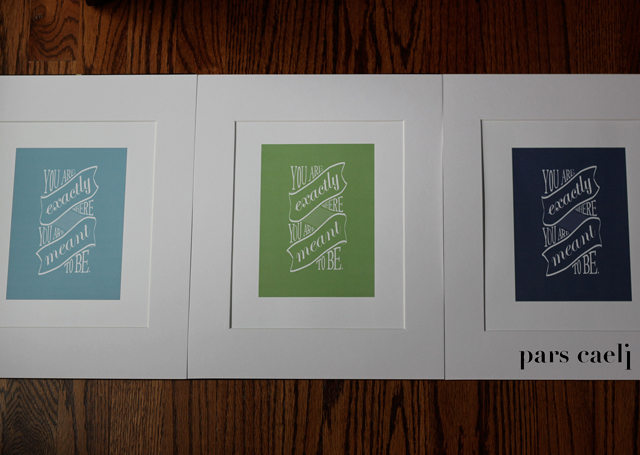 I made these prints two weeks ago with no remembrance of St. Thérèse's writing. Hmm, I think I have a fresh Divine bump on my head.